Bright Horizons School For Special Children Mangla Cantt Jhelum Punjab. M.Sc - Psychology, Preference will be given to experienced, individuals. Fresh candidates can also apply. BCS /MCS, Preference will be given to experienced, individuals. Fresh candidates can also apply. BA with good skills in playing a musical instrument, Preference will be given to experienced, individuals. Fresh candidates can also apply. FA, FSc & B.A, Retd Army person (clerk) can also apply. 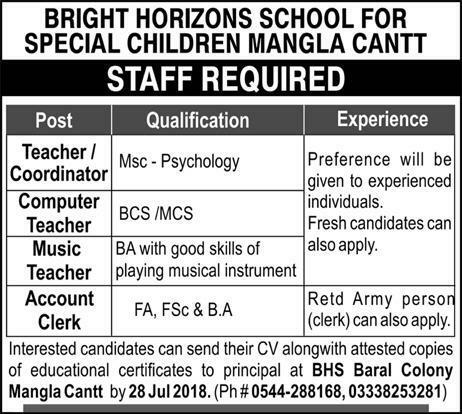 Interested candidates can send their CV along with attested copies of educational certificates to Principal at BHS Baral Colony Mangla Cantt by 28 Jul 2018.